Our Favorite Designs by Leif Bjorkheim include four pieces specifically designed for the jewels they contain. Each of these gems is of the highest quality, set in platinum or gold, and surrounded by dazzling diamonds. 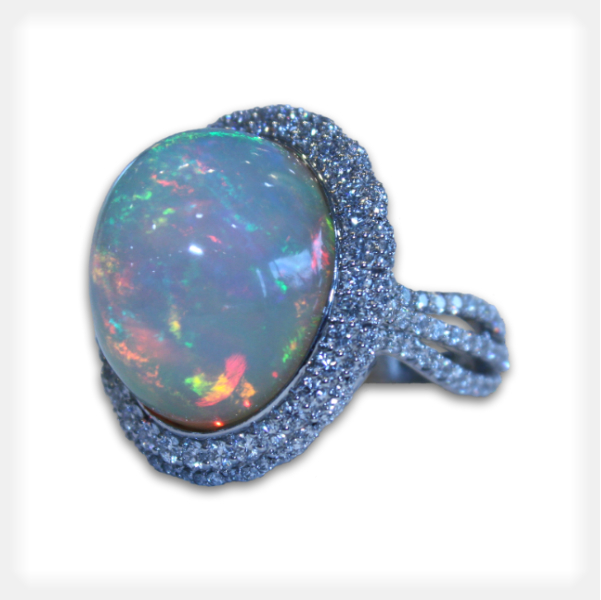 The beauty and fire in this solid cabochon custom opal jewelry is something each has to experience in person. Each angle has flashes of red, orange, green and yellow. 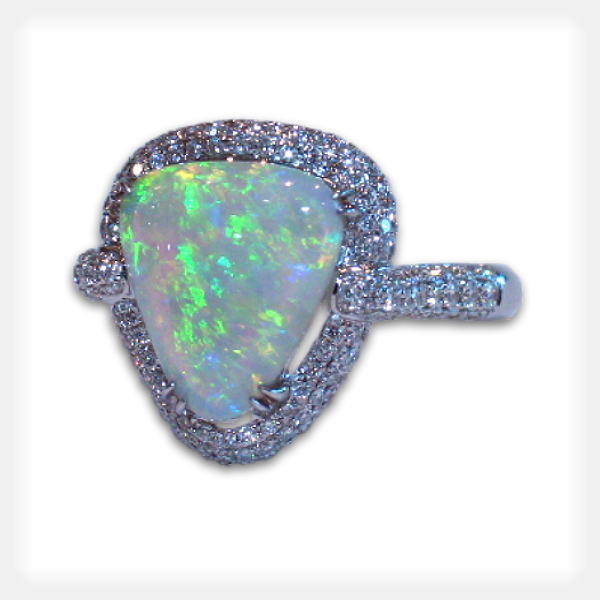 This is a beautiful custom opal ring mounting to accommodate the 15.88 ct Ethiopian Opal which is surrounded by 1.69 ct of pavé diamond accents. 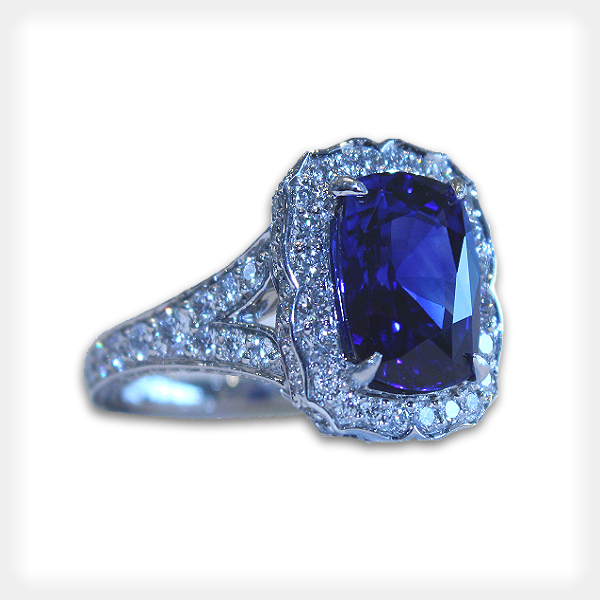 Our affectionately named “Lady Blue” is a stunning 3.72 ct Ceylon Blue sapphire certified by GIA that must be seen. She’s beautifully accented in a custom platinum setting and 1.21 ct of diamonds. One of our best custom sapphire engagement rings. This gorgeous African Zambian custom emerald engagement ring contains 1.82 cts of absolute beauty. 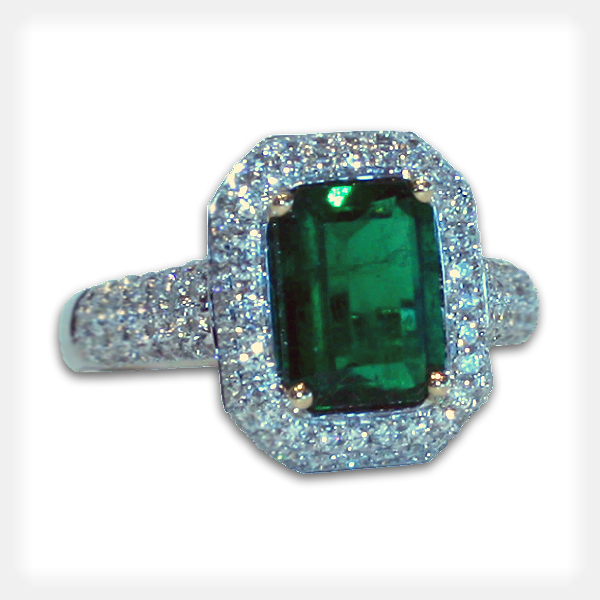 Set in 18k white gold, the setting uses 18k yellow gold prongs to accentuate the forest green of the emerald. The ring contains 146 diamonds at 0.86 cts set pavé along the shank and decorating the halo and cathedral of the head mounting. Showing off a complex array of greens and blues, with bolts of red, this trillion shaped 2.62 ct solid black Australian Opal is a reminder of cool waters and warm sands. Elegantly placed in an 18k white gold setting, the opal is surrounded by 181 diamonds at 0.82 cts set pavé in the halo and shank, and decorating the cathedral. It makes a beautiful custom opal engagement ring.